A delightful holiday musical for the entire family. It’s the true story of a Great Lakes schooner, whose captain risks life and limb to transport Christmas trees to the German immigrants in Chicago during the late 1800’s. The result was the Christmas tree tradition spread throughout the Midwest and America. Attend The Merlin Players’ production of The Christmas Schooner, opening Friday, December 2, at the Paradise Center for the Arts in historic downtown Faribault, and you’ll never view a Christmas tree in quite the same way. Guaranteed, you’ll appreciate your tree a whole lot more and the ease with which you can pull yours from storage, browse in a Christmas tree lot or tromp through the woods to chop down your own. Allow me to take you 6 ½ hours away from Faribault to eastern Wisconsin, to Rawley Point, a piece of land that juts into Lake Michigan in Point Beach State Forest five miles north of Two Rivers. 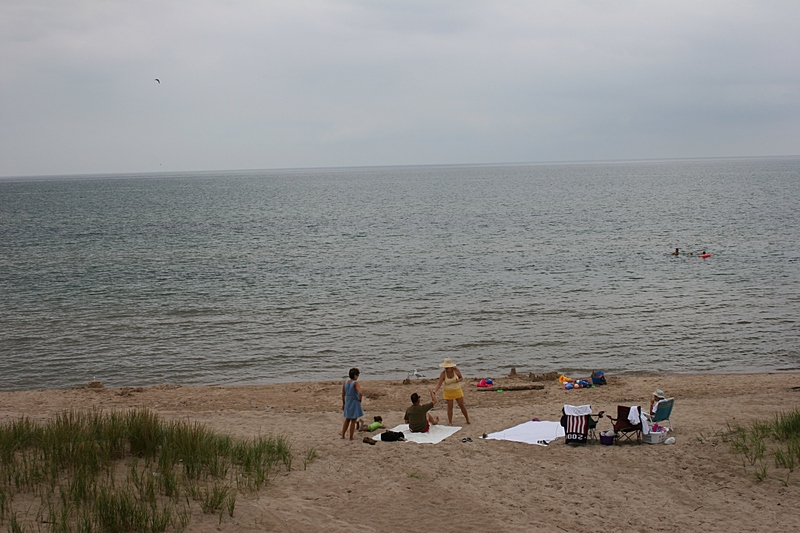 Rawley Point at Point Beach State Forest along Lake Michigan in early August. Off this point 26 ships sank or became stranded, including the steamship Vernon, which broke up in stormy waters in 1877 with 52 lives lost. Only one seaman survived. 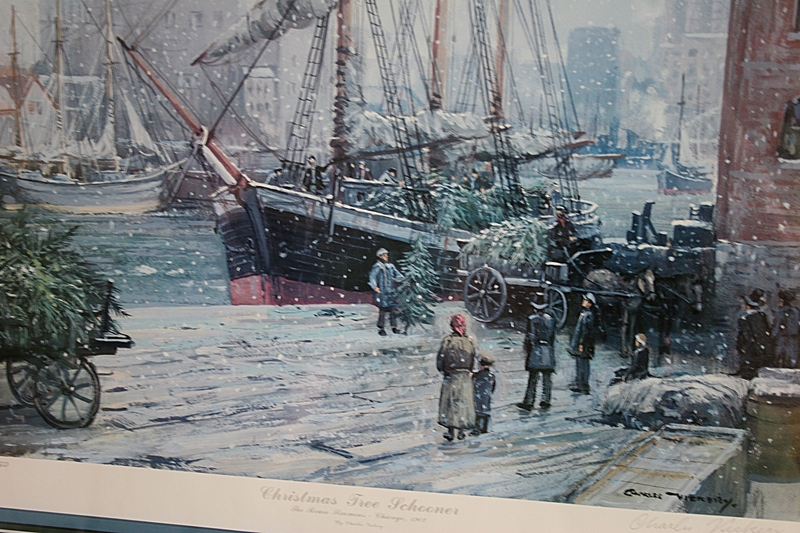 A painting of the Christmas Tree Schooner at the Great Lakes Coast Guard Museum in Two Rivers. The schooner, with 16 crew members, never reached Chicago. Not until 59 years later was she found in 170 feet of water off Rawley Point, her Christmas trees still stashed in her hold. 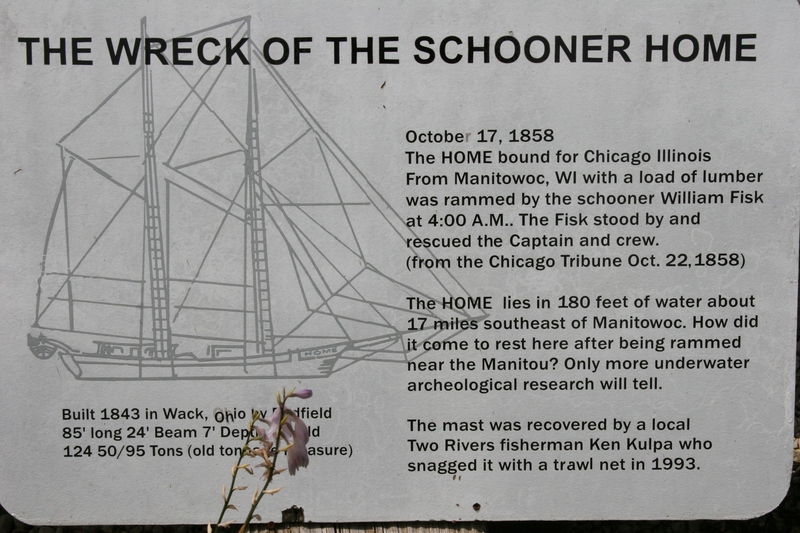 The schooner remains preserved in the icy waters of Lake Michigan. The beach at Rawley Point on a Sunday afternoon in August. Walking Rawley Point beach on an August afternoon, the only hazards are stinky dead fish and driftwood. 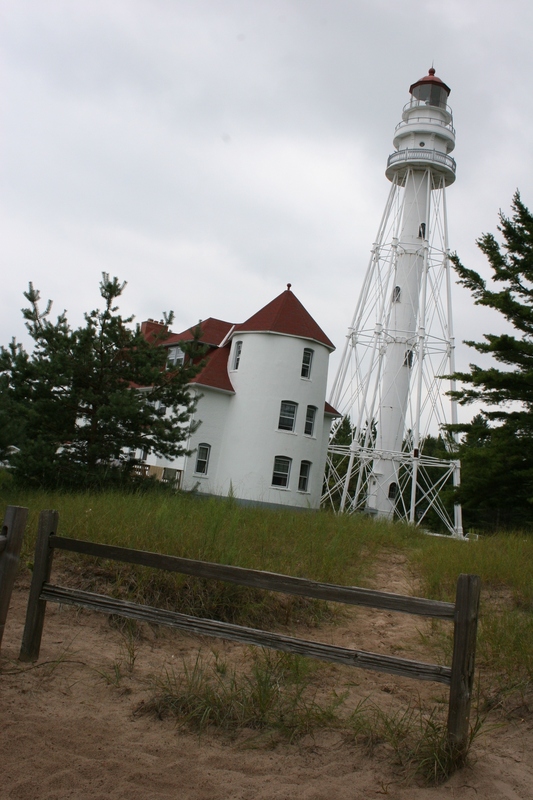 The U.S. Coast Guard's erector style lighthouse at Rawley Point rises 113 feet above Lake Michigan. The light is one of the largest and brightest on the Great Lakes and can be seen from 19 miles away. 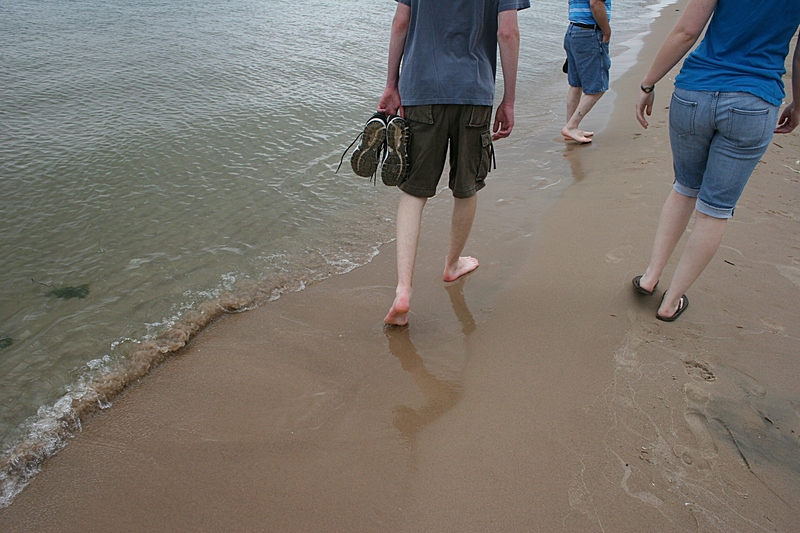 This past summer my family visited Point Beach State Forest and attractions in nearby Two Rivers, all within an hour’s drive of my second daughter’s home in Appleton, Wisconsin. 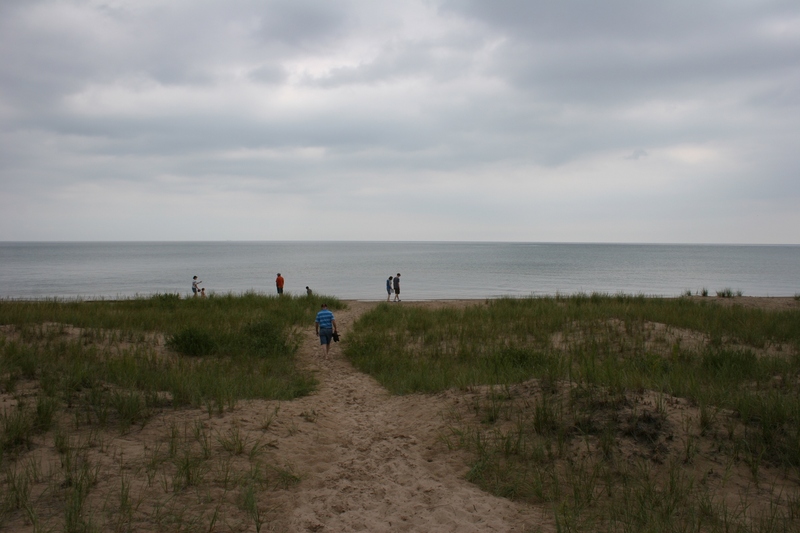 On that Sunday afternoon, strolling along the sandy beach near Rawley Point Lighthouse, it seemed impossible that Lake Michigan could transform into stormy waters that would become a grave for so many. Now you can experience the touching and tragic story of “The Christmas Tree Ship” via The Merlin Players’ The Christmas Schooner production. I saw this performance several years ago at the Paradise. I’ve never cried before at a play. 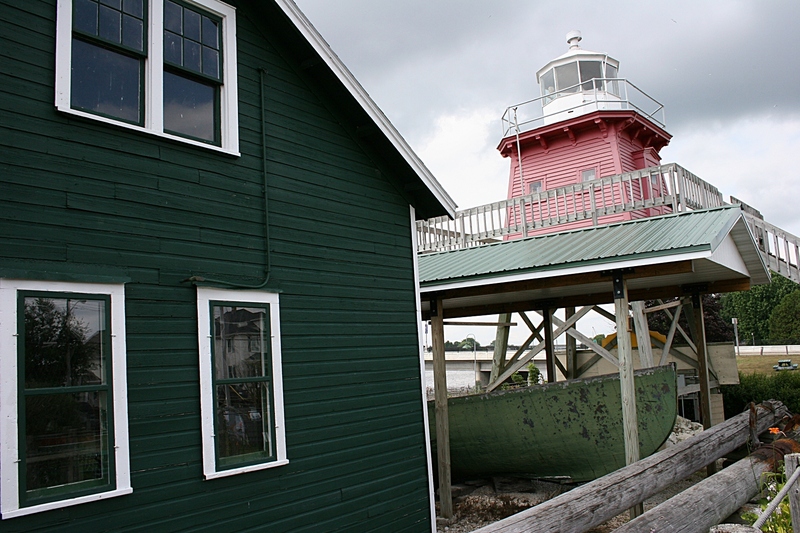 The historic Rogers Street Fishing Village includes the 1886 Two Rivers' North Pier Lighthouse, to the right. 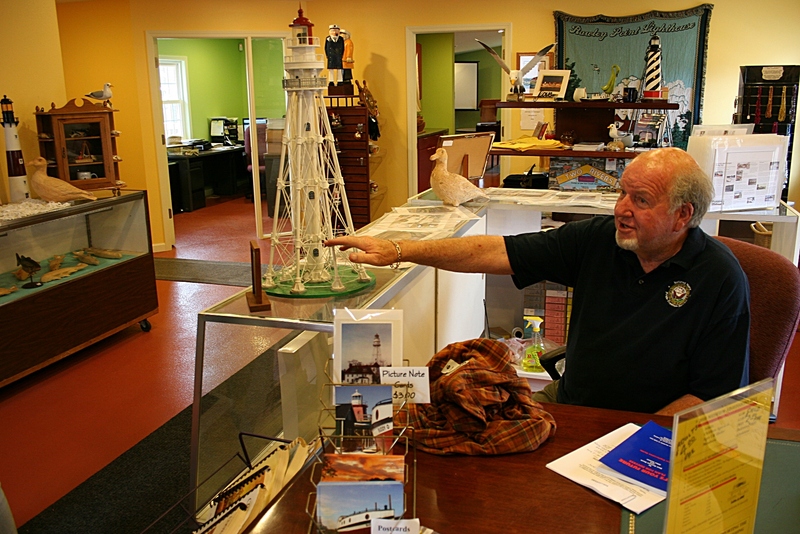 Inside the Coast Guard museum, a worker points to a model of the Rawley Point Lighthouse, which was moved from a French exhibit at the Chicago World's Fair in 1893 to Rawley Point. You'll find information and artifacts from area shipwrecks at the fishing village and museum. FYI: Performances of The Christmas Schooner are set for 7:30 p.m. December 2, 3, 8, 9 and 10 and at 2 p.m. December 4 and 11 at the Paradise Center for the Arts, 321 Central Avenue, Faribault. Admission is $14 for adults and $9 for those 12 and under. For tickets, call (507) 332-7372 or stop in during box office hours, from noon to 5 p.m. Tuesday, Wednesday, Friday and Saturday or from noon to 8 p.m. Thursday. I’d highly-recommend buying tickets in advance. CLICK HERE for information about the Rouse Simmons schooner from the Wisconsin Historical Society. CLICK HERE for info about Two Rivers, Wisconsin. CLICK HERE for info on Point Beach State Forest. CLICK HERE to read a previous post I wrote about the Hamilton Wood Type Museum in Two Rivers. DURING THE PAST WEEK, we’ve been bombarded with news stories and advertising campaigns aimed at Black Friday, Small Business Saturday and Cyber Monday, all with the underlying theme of spending. Honestly, I am tired of the greedy, materialistic consumerism that grips us during the pre-holiday season. Are we so materialistic that we have to skip or cut out early on family gatherings, fight each other in the aisles and buy items simply because they are on sale? I get nostalgic for those days when we weren’t quite so materialistically-inclined. But, if I’m honest, I can look back and see that even during the 1960s, when I was growing up, we, too, focused on the gift aspect of Christmas more than we should have. I could not wait for the mailman (not carrier) to drop off the J.C. Penney Christmas catalog in our mailbox at the end of our southwestern Minnesota farm driveway. My siblings and I fought over who got to look at the Christmas catalog first. By the time all six of us had thumbed through the wish book numerous times, the pages were worn and creased. We drew up Christmas lists from the catalog, wishing for the doll or the Army tank or the spotted Twister mat featured in the photos. Rarely did we get any of those requested items; our parents simply did not have the money. Even though we certainly dreamed and wished and dreamed and wished some more, we were content with whatever gifts we received. Today, however, I think many parents feel obligated to give their kids whatever they ask for. I don’t agree with that line of thinking. Kids need to learn and understand that they cannot have everything they want when they want it. But first, we as adults need to curb our own greedy consumerism and our desire to have everything we want when we want it. WHAT’S YOUR OPINION on consumerism this time of year, or in general? Let me hear your thoughts. 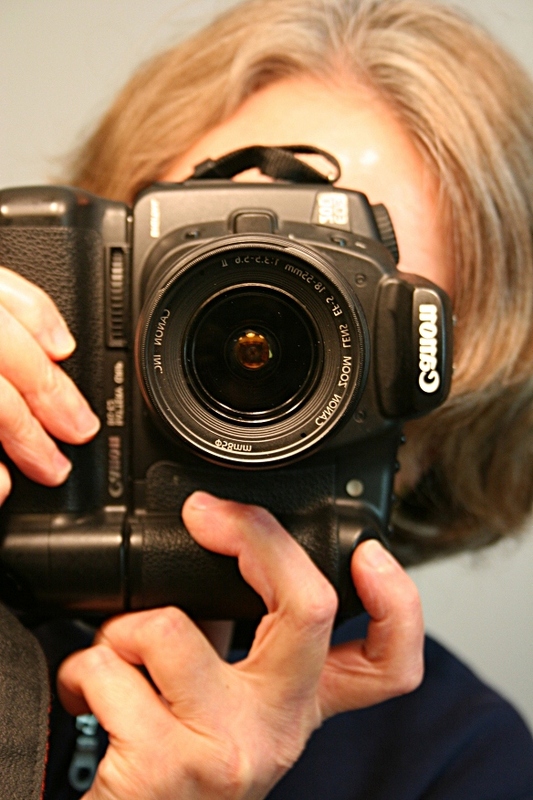 Me and my camera, a tool in the writing profession I love. ARE YOU FOLLOWING your life’s passion in your chosen profession? That topic came up for discussion at a weekend gathering with extended family. I was surprised to learn that my uncle always wanted to be a college history professor dressed in a tweed jacket with elbow patches. I looked at him through fresh eyes, wondering why I never knew this about a man who recently retired after decades of driving a delivery truck. He wasn’t discontent in his job, simply wished that he could have pursued his love of history as his life’s work. It wasn’t all that long ago when I learned that my maternal grandfather, my uncle’s father, wanted to be a lawyer, not the farmer his father expected him, and pushed him, to become. Today his grandson, my youngest brother, is an attorney. A sister who always wanted to teach initially chose another profession because a high school counselor told her she wouldn’t find a teaching job. She listened to his advice and attended technical college to become a travel agent. When that didn’t work out, she found herself working at a bank. Later she would enroll in a four-year college and today teaches special education. She still regrets those wasted years of failing to follow her heart. Likewise, the father of a friend advised her to choose a practical career as a nurse rather than pursue her dream of a career in art. Today she’s still a nurse, pursuing her artistic interests on the side. My father, upon returning to his southwestern Minnesota farm from a tour of duty as a foot soldier/infantryman during the Korean War, desired a job as a highway patrolman. With only an eighth grade education and likely because it was expected of him, he stayed on the farm to milk cows and work the fields. I have to applaud my parents for never once pushing any of their six children into a career. Today my siblings are engaged in diverse occupations as a parts manager at a southwestern Minnesota implement dealership, a floral designer, the CEO/GM of an ethanol plant, a special education teacher and an attorney. I’m the writer, following my passion for language and the written word. In all honesty, though, my husband’s job as an automotive machinist pays the bills and keeps the roof over our heads. My spouse enjoys his work, but he always wanted to be a rural mail carrier and even took a U.S. Postal Service exam some 20-plus years ago to try and break into the postal ranks. That never happened. I cite all of the above examples because I suspect the majority of us are working at jobs that are not true to our passions in life. Perhaps it’s circumstances or money or geographical location or a parent who pushed or a counselor who misguided—whatever the reasons, something has kept most of us from working at jobs in which we are truly content, that make our hearts sing. TELL ME. Are you working at a job that follows your passion? If you aren’t, why not, and what job would allow you to follow your heart? 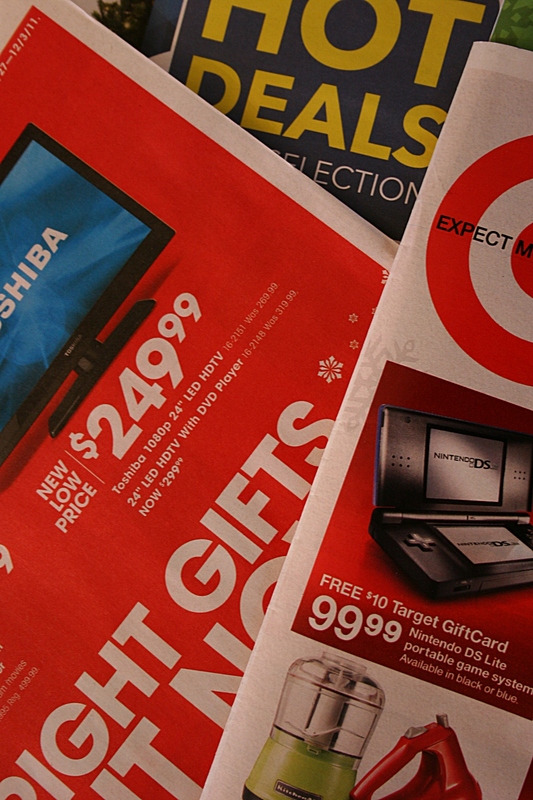 SO, DEAR READERS, did you shop today, on Black Friday? I hadn’t intended to, but then my oldest daughter ran downtown to the bank and I decided to tag along. We, along with my other daughter, perused merchandise at The Clothes Closet, a used clothing store operated by the Faribault Senior Center. As a bonus, the clerk threw in a free pair of $2 earrings on a “buy one, get one half price” special. Yes, I realize that now you could care less about any purchases I made and you would rather hear details of that shooting. But, alas, I have nothing more to tell you about the crime or the waiting-in-line Target shoppers who heard the gun shots and saw the cop cars and helicopter. At the Salvation Army Store in Faribault, signs of an earlier crime remained in a boarded up front window. Several weeks ago a man allegedly drove into the building then fled the scene. Why is it taking so long to replace that window? All this crime aside—and honestly, we typically do not have shootings in Rice County or cars driving into buildings—the second daughter and I spent $9.21 at the Salvation Army. 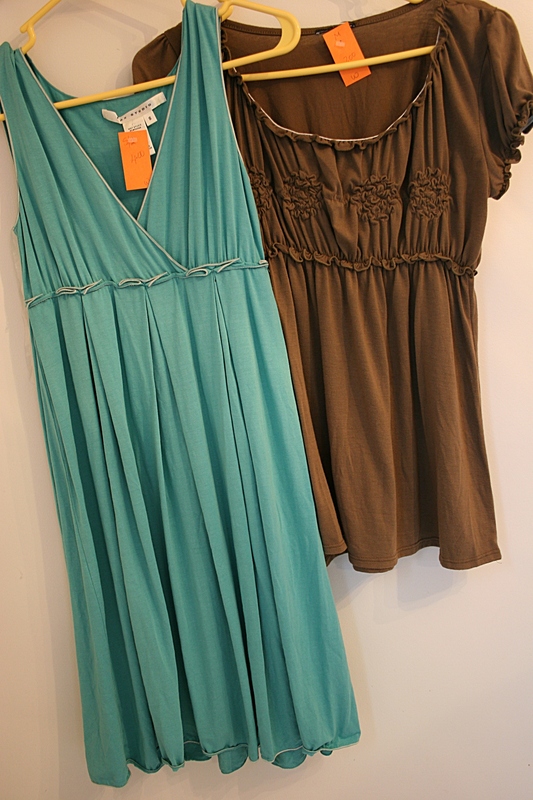 Miranda got a shirt and a dress. I got two vintage trays and an original painting. No crowds. No rush. No shootings. No worries. Just bargains with the money going to a good cause to boot. HOW WAS YOUR Black Friday? What did you do? If you went shopping, tell me about your experiences and deals. A $4 dress and a $2 shirt from the Salvation Army. 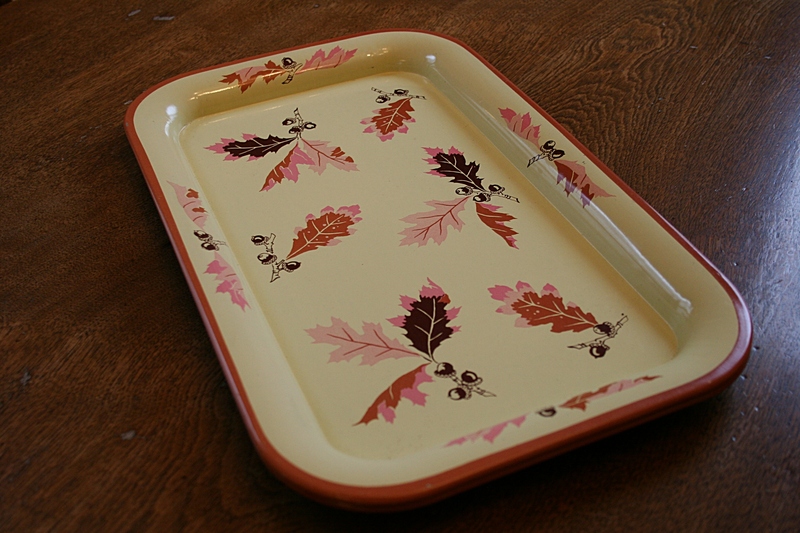 I purchased two vintage trays for $1. Thanksgiving Day dinner at my house with family. …that I am not battling the mobs searching for bargains, even if my sister terms Black Friday shopping as “fun.” She regales me with tales of shoppers smashing shopping carts into hers and the rule she and her daughter follow: “We won’t fight anyone over anything; it’s not worth it.” I’ve figured out the real reason she shops today. It’s all about tradition and being with her daughter and not really about the bargains. 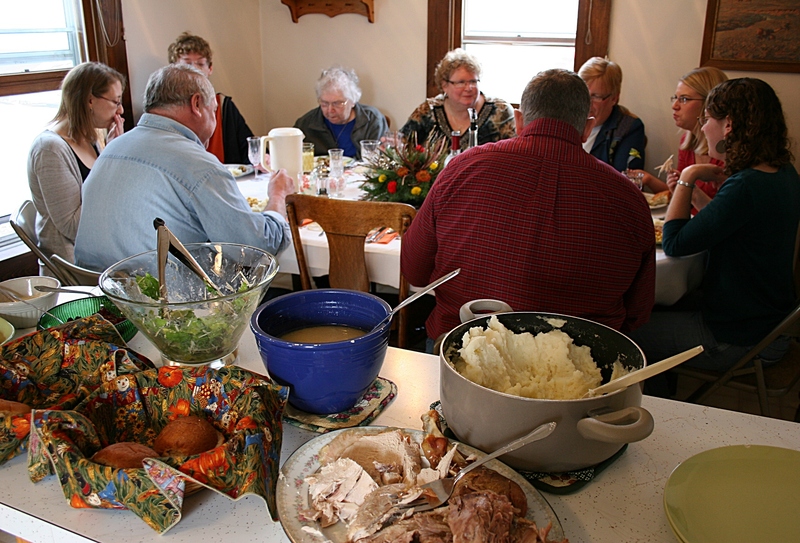 …that my mom could spend another Thanksgiving with me, my family and other members of my extended family. She’s 79 and not in the best of health. Last evening my husband and I drove her up to the McStop in Lakeville where my uncle and cousin met us. My mom will spend several days with her Arkansas sisters, her brother and their spouses in Minneapolis. Family time is precious. …for the 60-degree temperatures Thanksgiving afternoon that prompted us to pull out the lawn chairs and sit on the patio, the sun warming our backs in a brisk wind. 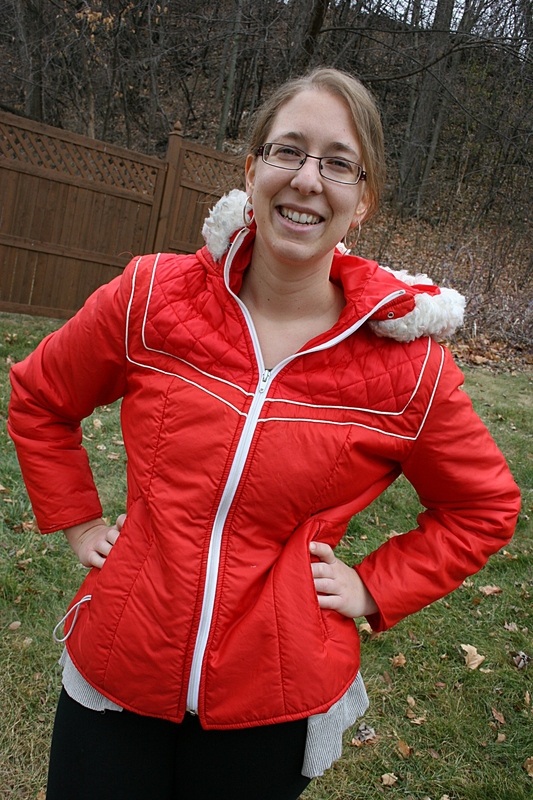 …that my second daughter made it home for Thanksgiving, her first trip back from eastern Wisconsin since May. She’s a Spanish medical interpreter and, with only one weekend a month free of on-call status, simply can’t come back to Minnesota as often as I’d like. …that my oldest daughter who lives in Minneapolis opted to sleep here on Thanksgiving, making me a particularly happy mom. I love having all three of my kids together with my husband and me for an evening and then all tucked into our beds, under the same roof, for a night. …that I am going to be a great aunt for the fifth time. My nephew made the announcement yesterday that he and his wife are expecting a baby in June. HOW WERE YOU blessed this Thanksgiving? 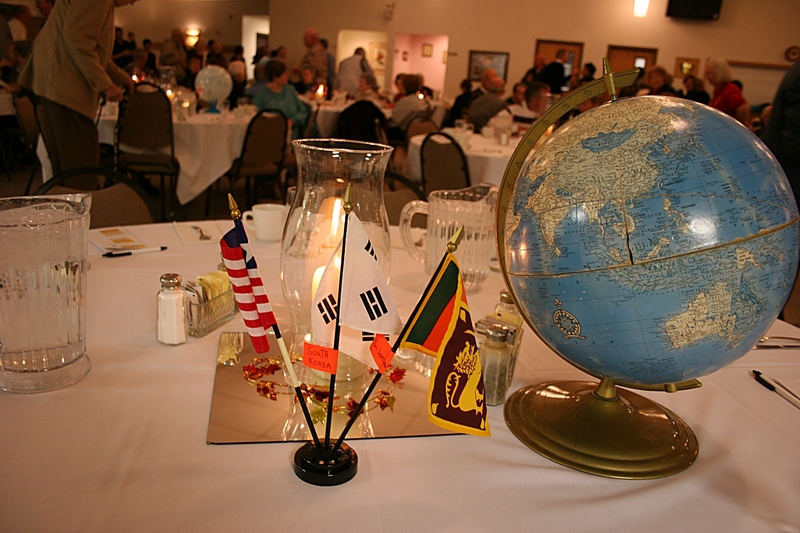 Globes and flags decorated tables at a missions appreciation dinner Sunday in Faribault. YOU KNOW HOW EVERY once in awhile someone says something and you suddenly appreciate your life a whole lot more than you did only minutes earlier? Take me on Sunday, when I spent an hour at morning worship services, another hour in bible study, 2 ½ hours at a mission gathering and another 3 ½ hours at a mission-centered appreciation dinner. You can bet I heard enough in those eight hours to realize I have it pretty good living right her in Faribault, Minnesota, in a three-bedroom mortgage-free home with one bathroom. Even though I have an outdated kitchen with a brown sink, leaky faucet, vintage countertops and yellowing cupboards, at least I don’t cook my meals outside over an open fire and I don’t live in a yurt. I don’t rely on the generosity of a missionary to supply me with two bags of rice so I have something to eat. I can speak freely about, and live, my faith without fear of reprisal. Missionaries in Iran would be killed for doing so if they were caught. Even though I’m unhappy with the high costs of health insurance and medical care, at least I have healthcare, unlike so many in Third World countries. Tears edged my eyes when I saw the photos and heard the story of 11-year-old Emay who died from an inoperable tumor. I am blessed to have been raised by Christian parents. I can read a bible that has not been censored and/or edited by the government. To those who spoke and sang during the “Let the People Praise!” Mission Event on Sunday at Trinity Lutheran Church in Faribault, and to Gary Thies of Mission Central in Mapleton, Iowa, thank you for snapping me out of my complacency. The timing couldn’t have been better, coming right before Thanksgiving. HOW ABOUT YOU? Have you heard or seen something lately that made you more appreciative of all that you have? FYI: Click here to learn more about Mission Central, the largest mission supporting agency in the U.S. for the Lutheran Church Missouri Synod. Credit goes to Thies for the “God is my boss” phrase cited above. Like a company president’s portrait in a corporate boardroom, Christ’s portrait hangs in Gary’s office, above his desk. DO YOU KNOW someone critically-injured or killed in a motor vehicle accident who was not wearing a seat belt? So when I picked up The Faribault Daily News and read this front page headline, “County on new motorist deaths list,” I was not pleased, not at all. From 2008 – 2010, Rice County had 14 motor vehicle fatalities. Nine of those individuals, or 64 percent, were not wearing seat belts. Ranking at the top of this list you don’t want to be on are rural Kanabec and Wadena counties, each with three fatalities, all three unbelted. Nearly every county on the list of 20 lies in a rural area. 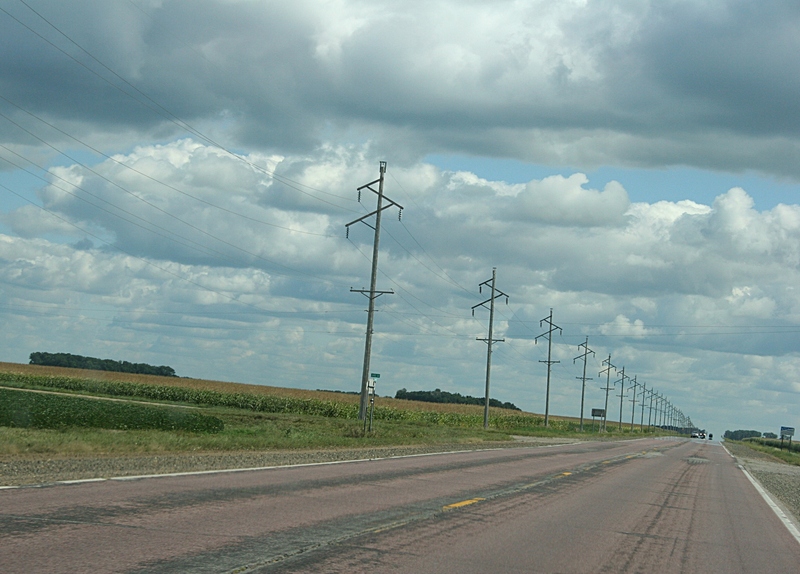 A rural southwestern Minnesota highway. Certainly, statistics do not tell the full story of these deaths. Many factors can contribute to losing your life in a motor vehicle accident. Yet, buckling up is the one simple action you can take to increase your chances of escaping death or severe injury in a crash. Common sense tells you if you’re not strapped in place, you’re most likely going to be ejected or partially-ejected from your vehicle during a serious accident. Why would you risk traveling without buckling up? I’d like to pose that question not only to my fellow residents in Rice County, but also to those living in Redwood County in rural southwestern Minnesota where I grew up. Redwood County, with a population of only 16,059, ranked third on the unbelted fatalities list with five of the six individuals killed from 2008 – 2010 not buckled in. Perhaps Minnesotans living in less-populated areas like Redwood County possess a false sense of security regarding travel on rural roads. I know that region of Minnesota well. You can sometimes drive forever without seeing another motorist. And seldom do I see a law enforcement vehicle. But that should not stop drivers and passengers from wearing seat belts. As much as I detest the traffic congestion and often times crazy driving in the metro area, I know that I am statistically safer on Twin Cities highways than I am on rural roadways. 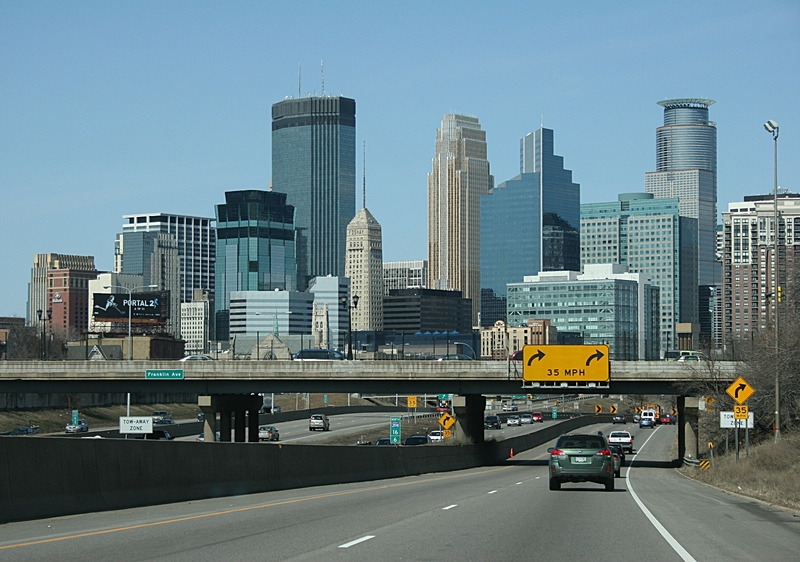 A rare, uncongested drive through Minneapolis. That brings us back to Rice County in southeastern Minnesota along Interstate 35. I don’t consider my county—with a population of 63,034, the state’s 13th most populous county and an hour from downtown Minneapolis—to be rural although we certainly have plenty of farms and back roads. Why are people failing to buckle up here? How does that relate to driving while impaired? When a law enforcement officer stops a driver in Rice County for failure to wear a seat belt, does the officer ask why the motorist is not buckled in? Can that question legally be asked? Recently, two Faribault High School students were ejected from a vehicle during a crash. The unbelted driver, a 17-year-old member of the FHS football team, suffered a neck injury and was released shortly after the accident, according to an article in The Faribault Daily News. His unbelted 16-year-old passenger was critically-injured. I hope the two teens involved, and their families, will approach local school officials to use this as a teachable moment to promote seat belt usage. As parents of most teens will tell you, an experience shared by a peer can accomplish what all the lecturing in the world by a parent cannot. Realistically, I realize that no matter how hard we try collectively to increase seat belt usage in Minnesota to 100 percent via contests, education, laws, enforcement of laws and more, we’ll never reach perfection. But we’re getting close at 92 percent of Minnesotans now buckling up, according to the state Traffic Safety office. Residents of Rice and Redwood counties, and all those other 18 counties on the state’s “unbelted fatalities list,” please buckle up. Honestly, I don’t like reading stories about traffic deaths that could have been prevented. DO YOU BUCKLE UP every time you get into a motor vehicle? Why or why not? Share your personal reasons, your story.